Iran has reacted angrily to a map of Persian Gulf in a recent issue of National Geographic, which showed the name 'Arabian Gulf' next to "Persian Gulf' in reference to this body of water. This anger was expressed by the Iranian government and many Iranian political groups regardless of their support for or opposition to the Islamic regime. The incident has also increased Iran's sensitivity to other circumstances where Persian Gulf is referred to as 'Arab Gulf' or 'Arabian Gulf'. Iran has even threatened to boycott the 2006 Asian Games in Doha, Qatar if the game sponsors continue to use the name 'Arabian' Gulf in their official documents. While Arab countries have repeatedly used the name Arabian Gulf in the past four decades, Iran's reaction has never been as severe as the National Geographic incident. This incident has increased Iran's sensitivity to such a high level that it could have an adverse effect on Arab-Iranian relations. Under popular pressure, Iranian officials will have to react to any future incidents where any international organization uses the name "Arabian Gulf". This will be a difficult battle for several reasons. First, as Iran shows more sensitivity to "Arabian Gulf" the Arab countries (specially the littoral states of Persian Gulf: Saudi Arabia, Kuwait, Bahrain, UAE and Qatar) will react by trying harder to promote this name. Second, these Arab countries are gaining more economic and political significance because of their rising volume of trade and investment with rest of the world. Profit oriented institutions such as multinational oil companies frequently use the name "Arabian Gulf" to please the Arab countries and protect their interests. Some of these entities that want to be in good terms with both Iran and Arab countries, refer to the Persian Gulf as "the Gulf" to maintain neutrality. We can expect the Arab countries of Persian Gulf to use their rising economic power to promote the usage of 'Arabian Gulf'. 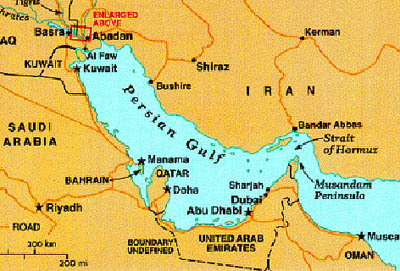 Despite these difficulties Iran is right to fight for the protection of the name of Persian Gulf. However, a confrontational approach, which relies on protest and boycott is not enough and might not even be successful. Iran should also address the root cause of this issue by engaging in direct negotiation with the Arab countries that insist on changing the name of Persian Gulf. If unresolved, this dispute could lead to mistrust and animosity on both side and create a fertile ground for future Arab-Iranian conflicts. I'm not predicting that Iran will go to war with any Arab country over this 'name' dispute but the ill feelings that will result from this dispute will make it more likely that disputes over other issues could lead to conflict. The Arab world has a dual feeling about Iran. While Arab nationalism and long history of Arab-Iranian rivalries have led to ill feelings on both sides, many Arabs admire Iran for its pro-Palestinian position. In the first decade after the Islamic revolution the Arab-Iranian relations deteriorated because of the Iran-Iraq war and Islamic regime's campaign to export Islamic revolution to the Arab countries. The relations improved in 1990s, particularly after Mohammad Khatami won the presidential election in 1997. Saudi Arabia and Iran have improved their relations and increased their bilateral trade in the past five years. More recently Iran has restored diplomatic relations with Egypt. Iran and United Arab Emirate are locked in a territorial dispute over three small islands in Persian Gulf but despite this dispute they have also had several high level diplomatic contacts in recent years and Iran is one of UAE's largest trade partners. In addition thousands of Iranians live in UAE's commercial capital, Dubai. As a result of these improved relations and the goodwill of ordinary Arabs toward Iran, the Iranian government might be able to resolve the name dispute through direct negotiations. The argument is simple. Arab's never challenged the name of Persian Gulf before 1960s. Calls for replacing 'Persian' with 'Arab' were first made by the Egyptian nationalist leader Jamal Abdul Nasser in reaction to Iran's support for Israel. It has since gained a momentum of its own despite the complete reversal in Iran's policy toward Arab-Israeli conflict after the Islamic revolution. Iran can argue that since the name change was a reaction to Iran's pro-Israeli position prior to the 1979 revolution, the Arabs must show their appreciation for Iran's pro-Palestinian policies after the revolution by respecting the name of Persian Gulf. Direct negotiation has a good chance for resolving this dispute because it is in the interest of Arab world to have good relations with Iran and many Arabs are well aware of this. Peace and friendship with Iran will enhance the Arab world's bargaining position in the Arab-Israeli conflict and improve the security of oil exporting countries of Persian Gulf. Iranian government should first approach those Arab countries that have had close relations with Iran in recent years such as Syria and Saudi Arabia and ask for their assistance in convincing other Arab countries to respect Iran's demand. If Iran can manage to establish warm relations with the new government of Iraq, it can count on Iraq's help on this initiative as well. Resolving potential sources of conflict with the Arab world is in Iran's strategic and economic interest as well. Iran has worked hard since 1997 to improve its relations with the Arab world and this effort has been partially successful. Preserving and improving these relations is in Iran's long-term interest. Iran should choose a strategy for protecting the name of Persian Gulf that will be compatible with this objective. Negotiation and direct talks with the Arab world should come before threats and boycotts. Nader Habibi is an economist with concentration on Middle East economies. He is currently the Managing Director of Middle East and North Africa region in the economic consulting firm Global Insight.